We want you to surf, a lot! So during your stay with us, we make sure that the only things you have to think about are surfing and relaxing. 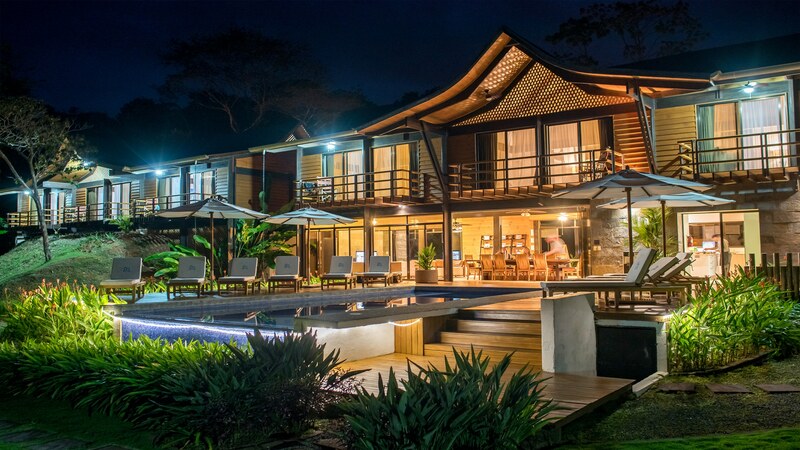 Just arrive at San Jose, Costa Rica – we’ll be there to pick you up in our SUV for a comfortable & enjoyable ride along the coast to Kalon Surf. Stay in one of our spacious rooms, with 180 degree panoramic Pacific Ocean views, king size bed with 400-count luxury linens, and en suite bathroom. 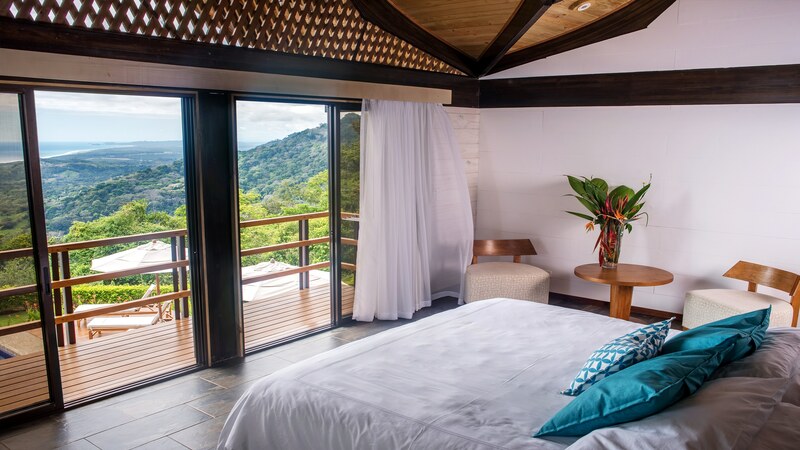 Spend your mornings watching the waves roll in and peeking out at the surrounding jungle, which is home to our private trail and organic garden. You’ll feel completely relaxed. Take an evening swim in our infinity pool. Read a book in a rocking chair on your balcony or under a mango tree. Grab beer, wine, juice, smoothies, brownies, or tropical fruits whenever you’d like from our open kitchen! With porcelain and ceramic floors, large glass windows, and a communal kitchen table the Kalon mansion has a warm, open ambiance we know you’ll find inviting. Absolute beginner or more advanced? 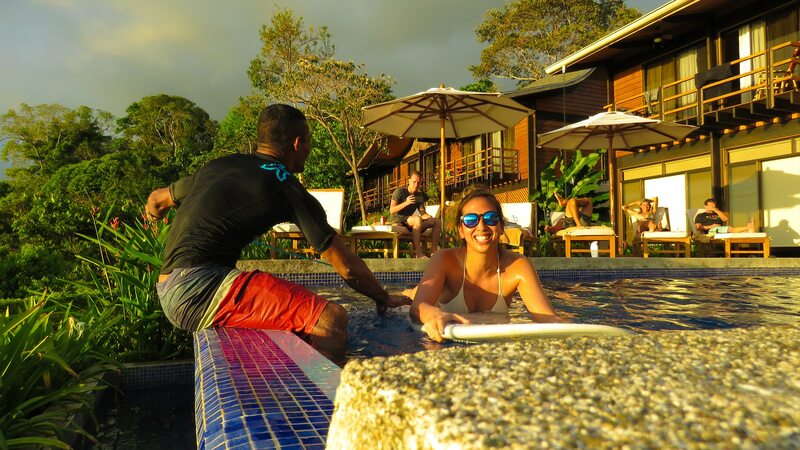 With our surf coaches you will spend hours surfing against the backdrop of long, uncrowded stretches of beaches and lush jungle, rainforest, and mountains. We have insider information and know how to pick the right beach to surf at depending on your skill level and the conditions of the day to make sure you have the best time possible. 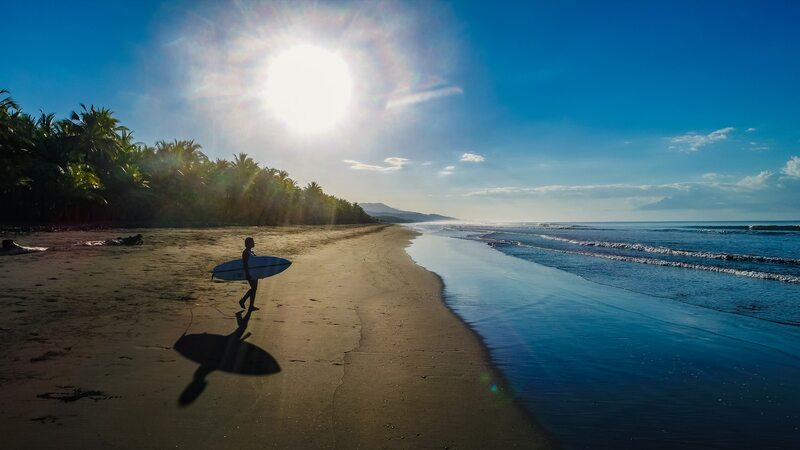 Getting to surf on these pristine beaches is a unique, unforgettable experience. Spending hours surfing is enjoyable, but also challenging for the body. That’s why Andrea and Silene teach Pilates classes that are tailored to surfing so your body can recuperate even faster. Need even more to relax and rejuvenate your muscles? We make sure you receive a mid-week massage by our onsite masseuse. At Kalon, food is one of our biggest passions - we want you to feel healthy, invigorated, and ready to surf. 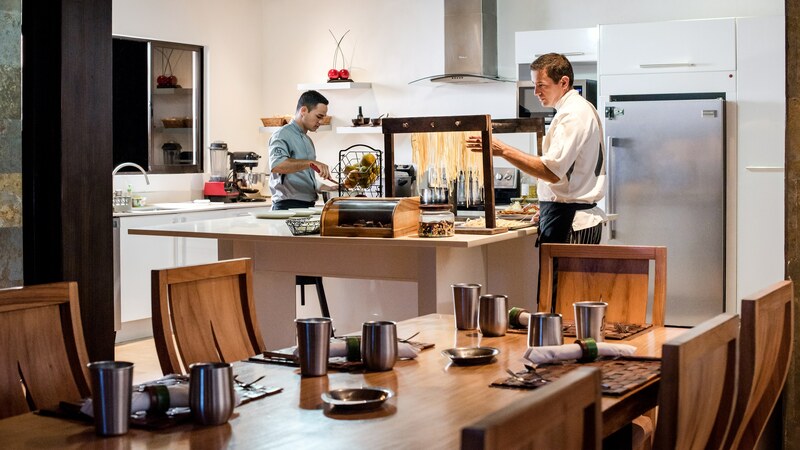 Every evening, our chef will prepare you a 3-course dinner. Lunch is served either on the beach or at the mansion while you watch the waves roll in. Gourmet coffee, homemade bread, traditional “Gallo Pinto”, fresh tropical juices, french toast, and more can be plucked from our buffet-style breakfast. 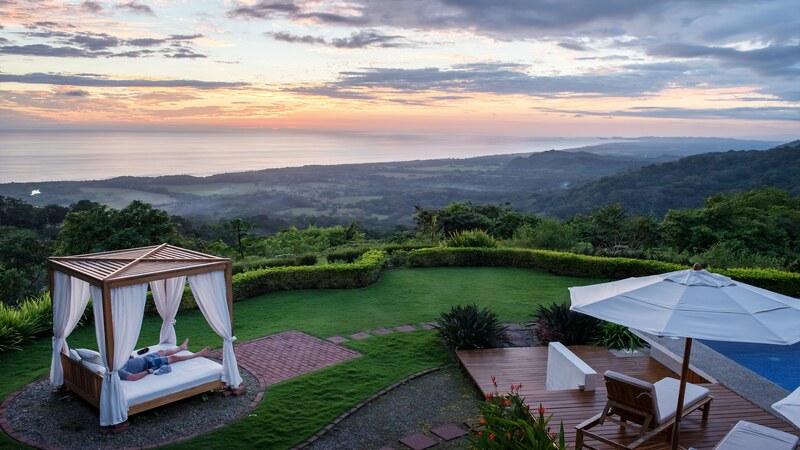 From fishing, horseback riding, and waterfall viewing to zipline and canopy tours, Costa Rica has many adventures on which to embark. We’re happy to help you decide which tours to take and even book them for you. Kalon Surf is near Dominical and Manuel Antonio in the south of Costa Rica - it’s a gorgeous country with a rich culture, delicious food, and diverse ecosystems. The people are friendly, the jungle stretches right up to the beach, and there is a distinct lack of mass tourism. It’s a wonderful place to be, and our resort is inspired by it. Learn surfing basics in the comfort of the Kalon pool. But most of all, come for some fantastic surfing on some gorgeous beaches! 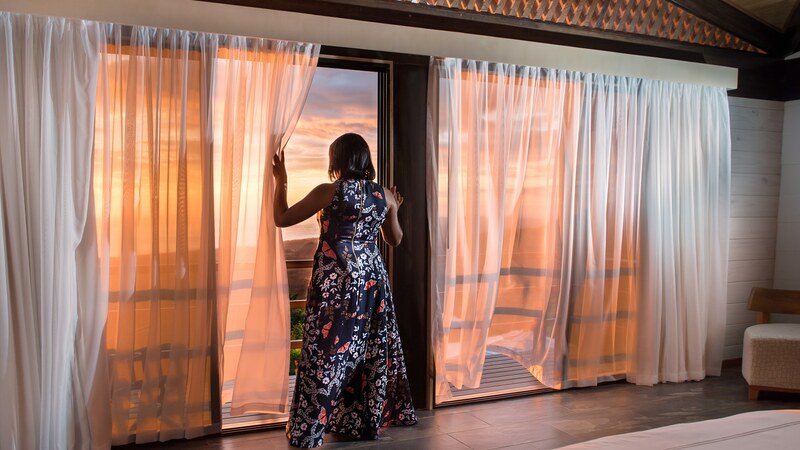 Each room has an incredible 180° view of the sprawling Pacific Ocean, soft linen sheets, ensuite bathroom, and balcony. All inclusive from the moment we pick you up in San Jose, Costa Rica until we get you back there after a great week with us. One of the best parts about our resort are the people that work here. Our passionate staff are incredible. They want our guests to have one of the best weeks of their lives and it shows through the work that they do. Originally from San Jose, Nathalie is passionate about Costa Rican culture and community. She loves helping guests with advice and arrangements so that they have the best possible experience. Loved by our guests, raved about in the Kalon Surf Reviews. Andres has been surfing for over five years and skateboarding his entire life. He has a vast knowledge of the area and spends countless hours exploring the coast to find guests new spots to surf. He loves seeing our guests improve and learn how to surf. 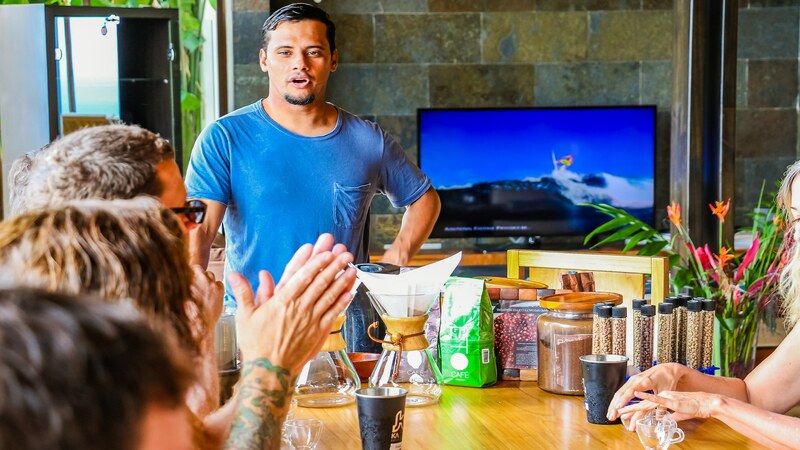 After Juan joined Kalon Surf in 2015, he took our food to the next level. He brings years of experience working in various kitchens, an open mind, and an incredible focus on creativity and quality. We recently introduced a new dinner menu that utilizes the innovative cooking technique, Sous Vide, and guests love it. His favorite kind of cooking is molecular and his favorite item to cook is fresh fish. Edelma is part of Kalon's team of star maids, always with a smile preparing breakfast and keeping the hotel impeccable. She is your sunshine in the morning, responsible and dedicated to her work and always willing to interact with our clients and make sure they feel as good as possible. Andrea is from San Jose and makes sure that our operations and processes work flawlessly. She will be your contact for virtually all your pre arrival questions and scheduling your arrival, departure and optional tours, she makes sure that the transition from booking your trip to arriving at Kalon and enjoying the amazing views, surf, and food is as relaxing as it gets. Want to take a peek into what life at Kalon is like? Check out some of our most memorable experiences via Instagram.